In the Friedrichsruh version of The Proclamation of the German Empire [Die Proklamierung des Deutschen Kaiserreiches], Anton von Werner took even greater liberties with regard to historical fact than he did in the palace version and the 1880 woodcut. 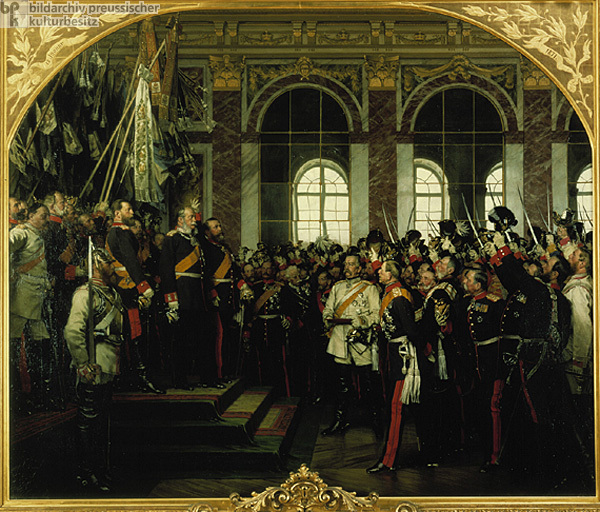 The Friedrichsruh painting was commissioned by the Prussian royal family in February 1885 as a present for Bismarck’s upcoming 70th birthday (April 1, 1885). As in the 1880 woodcut, Bismarck is shown in his white Cuirassier uniform (which, as was explained in the previous caption, he did not actually wear on January 18, 1871). Likewise, he is shown in the same thigh-high Cuirassier boots, and his authoritative stance remains largely unchanged. But this 1885 painting differs from the 1880 woodcut in at least one important sartorial detail – the Pour le mérite medal, which had only been awarded to Bismarck in 1884, now appears on his uniform. This addition was not the only noteworthy change. For example, Chief of the Prussian General Staff Helmuth von Moltke assumes greater prominence than in previous versions of the scene, and Prussian War Minister Albrecht von Roon, who was not present that day on account of a bout of catarrh, has been inserted into the assembled crowd. As Matthew Jefferies pointed out, it is remarkable that all of the major figures in the Friedrichsruh version look as they did in the 1880s, not as they had in 1871. Thus, its value as a “snapshot” of an event fourteen years earlier was necessarily diminished. It is important to remember, however, that the various versions of Werner’s Proclamation responded as much to the desires of individual patrons than to the notion of historical truth. Insofar as this version was intended as a birthday gift for Bismarck, it is entirely natural that he would take center stage and be surrounded by his closest friends and colleagues. It is just as logical that, by 1885, the unostentatious and rather hurried proclamation depicted in the palace version should have been transformed into a much more vibrant and symbolically rich portrayal of the empire’s founding – and its “founder.” This painting still resides in Bismarck’s former estate in Friedrichsruh.